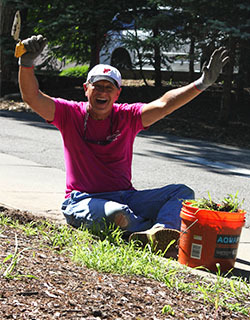 One of the most rewarding ways to give to The Woodlands is with your own two hands. So much of what we do and the programming we provide takes a village to do the best work for our community. We have a wonderful group of dedicated volunteers who are enriched and inspired by the contributions they donate through their presence. If you’re looking for a life-changing experience that will change more lives for the better, please explore our volunteer opportunities. Maintaining The Woodlands’ campus and keeping full access throughout the year offers many challenges for our small staff. 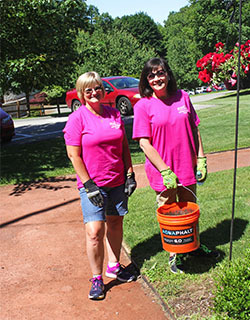 The Corporate & Group Volunteer Program began in 2002 as a way to find assistance with campus needs, while providing local corporations, businesses and organizations with an opportunity for their staff to share their time and energy while helping The Woodlands to accomplish facility related projects. This experience is a fantastic way to not only make a direct impact in the lives of individuals with special needs, but also participate in a great team-building exercise. For more information, contact Mikayla DiCesare, Special Events & Corporate Relations Coordinator, mdicesare@woodlandsfoundation.org. You can be a community champion all on your own. The Woodlands offers many opportunities for you to participate in projects, help with activities and interact with our participants. Volunteering is a great way to give back to the community, and the personal rewards and experiences will last a lifetime. Volunteers must be 14 or older. Accompanying adult must also complete all steps of volunteer process, including orientation and clearances. If you are interested in volunteering as a BLOOM peer counselor, please click the button below for an application or click HERE for more information about the BLOOM program). Complete a Volunteer Application. Click the link below to download the application. Submit Individual Volunteer Application by email or mail to our contact below. If your volunteerism at the Woodlands includes interaction with participants, we require Act 33 (PA Child Abuse) and Act 34 (PA Criminal Background Check) clearances. We will only accept clearances obtained within one year prior to your first volunteer shift. To obtain an instantaneous PA Child Abuse Clearance that you may download and print, click here, select “Create Individual Account” (if you do not already have a Child Welfare Portal login) and follow the prompted steps to completion. To obtain an instantaneous PA Criminal Record Check that you may also download and print, click here, select “New Record Check (Volunteer Only)” (if you do not already have a login) and follow the prompted steps to completion. For more information, contact Clarissa Amond, Staffing and Volunteer Coordinator, camond@woodlandsfoundation.org . The mission of the BLOOM program is to create a reverse inclusion wellness and development program for adolescents with and without disabilities focusing on social skills, communication and peer interaction through sports, recreation and nutrition activities. BLOOM is designed to promote the inclusion of youth and young adults with disabilities into all aspects of society through recreation and physical activity. The program focuses on physical activity designed to develop self-determination, empowerment, overall health and leadership for adolescents in transition. The recommended age range for peers is 13 to 21 years old. Cultivating friendships – Real friendships can be developed with other participants. Acquiring social skills – Individuals with disabilities are more likely to develop social skills necessary to develop relationships when participating in inclusive recreation opportunities. Improving attitudes – People often develop positive attitudes about diverse individuals as a result of joint participation in some activities. Developing life-long skills – Through the presence of appropriate inclusive recreation options, the development of life-long functional recreation skills will be promoted. Enhancing image – The image of a person with disabilities is higher with inclusive participation as opposed to segregated participation. Increasing understanding – Exposure to inclusive leisure services results in a greater understanding and acceptance of individuals of varying backgrounds and abilities. For more information, contact BLOOM Program Coordinator Shania Barnhart, sbarnhart@woodlandsfoundation.org. The Woodlands’ Volunteer Counselor Position provides a more immersive volunteer experience for those looking to gain experience and make a difference. Volunteers work alongside Woodlands counselors and healthcare staff to make camp a success. Volunteers work with all ages and a diverse population of individuals with disabilities.